The rainy season has ended, and along with the heat and humidity, late July, August and early September mean festivals in Japan. You’ll find them all over the country, and even in local neighborhoods, either 祭り (まつり, matsuri, festival) or 花火大会 (はなびたいかい, hanabi taikai, fireworks display/show). Matsuri generally refers to a festival (as that is what it means), which can take on various forms depending on the type of festival it is. For example, I wrote about the big Shimada Obi Matsuri last year, which is specific to Shimada city in Shizuoka prefecture, but there are hundreds of other types. And then there’s fireworks festivals, or 花火大会. Sometimes these happen in conjunction with a regular matsuri, or they may happen separately (particularly the big events). My local neighborhood (or 町, machi/cho, also known as "town") holds a small festival at the nearby temple every summer, and they shoot off fireworks at night. One large fireworks festival I have particularly enjoyed here in Japan is the Fukuroi Fireworks Festival in Shizuoka. You can read more about it in my write-up here on SiJ, and if you're interested in going, check out this Fukuroi Fireworks Festival post for specifics (in English). So if you’re in Japan, whether you live here or just visiting, I certainly recommend checking out a festival of some kind, in particular the fireworks festivals. But how do you find them? One way, of course, is by word of mouth from those that live in your area. You may also see posters at nearby train stations advertising upcoming festivals. It’s also likely your city and/or prefectural website lists upcoming events (sometimes in English). And as you may already know, it’s not difficult to find some of the biggest events in Japan, online, in English. However, there are also websites that list festivals all over Japan, not just the most popular, and provide necessary info such as where they happen and when. Though these are in Japanese, they may help you find a festival you wouldn't otherwise know about. And for those of you wondering how in the world to navigate these sites in Japanese, let’s look at Walkerplus, so you’ll be able to easily find festivals too. 1. Go to the Walkerplus site. 2. Choose your desired region on the map (see image below). 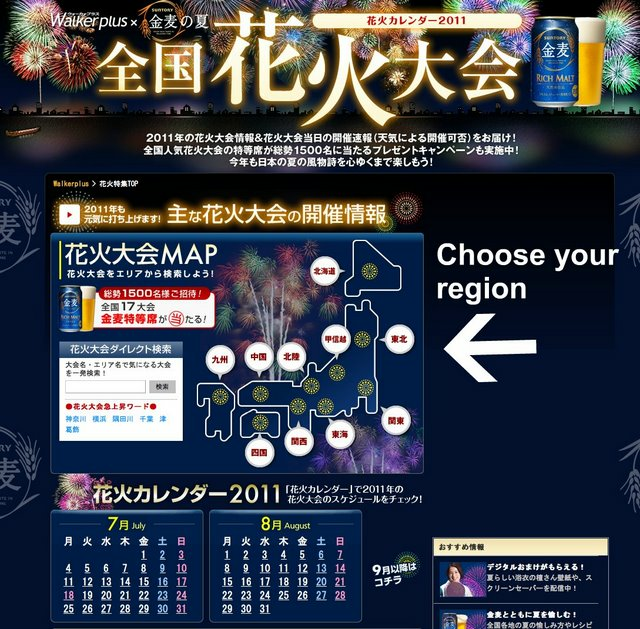 In this case I’m going to choose the Tokai region (東海, とうかい). If you aren't sure what region you're in or what the kanji look like, try this list. 3. 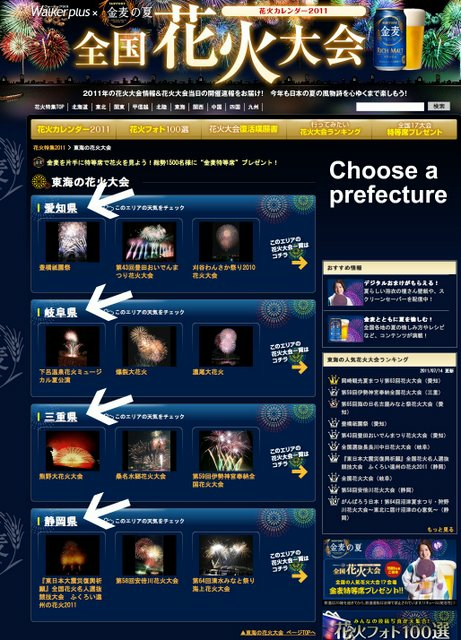 Next, choose your desired prefecture. Four are listed in the picture below in the Tokai region, including Aichi (愛知, あいち), Gifu (岐阜, ぎふ), Mie (三重, みえ), and Shizuoka (静岡, しずおか). I’m going to choose Shizuoka. (I added the white arrows). 4. The page that comes up is divided into four categories: upcoming scheduled events, finished events, events canceled for 2011, and events yet to be confirmed. The columns include the date, name of the festival, name of the city or town where the event is taking place, and the number of fireworks to be launched. As you can probably guess, some of these are subject to change. Browse through and choose the event you’re interested in. Note: the information is constantly updated so you'll likely find events changing categories. 5. The next page will give details about that particular event, including date, time, when the event will happen in case of bad weather, event location, the number of fireworks to be launched, last year's turnout, access information, parking information (if applicable), official website (if applicable), and information about paid seating (though most festivals you can just bring a tarp or blanket or tent and "reserve" a free spot anywhere outside of the paid seating areas - best to get there early!). You can also search by date via the calendar on the main page by choosing a day, and then selecting a region from the horizontal list that appears right above the results and below the calendar. The other two sites are a bit different in layout and navigation, though not that much, so aren't too difficult to use if you can browse through the one above. 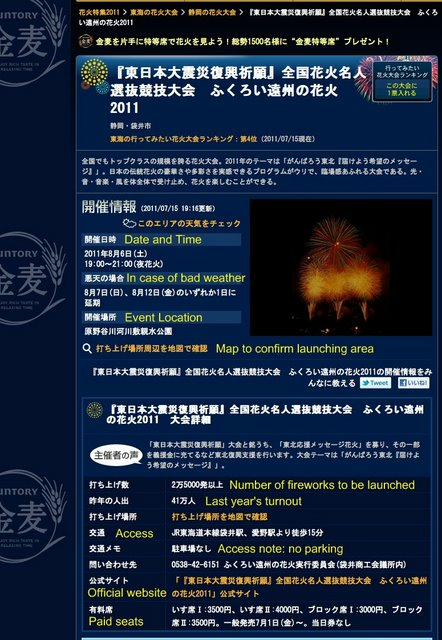 There are of course, other sites as well, which you can usually find by searching for 花火 (and the current year). 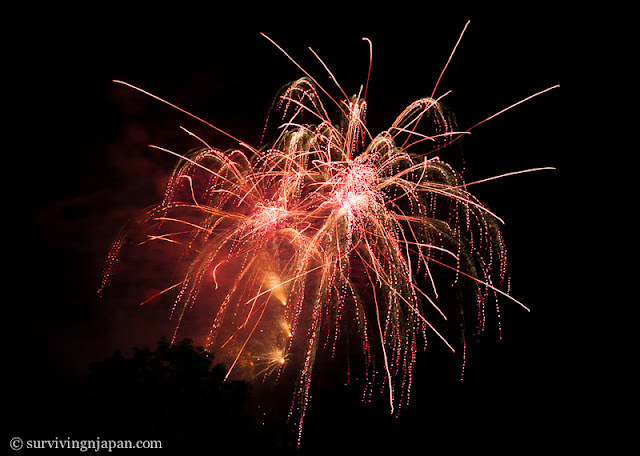 So tell us, what is the best fireworks festival you've been to in Japan? Any recommendations?